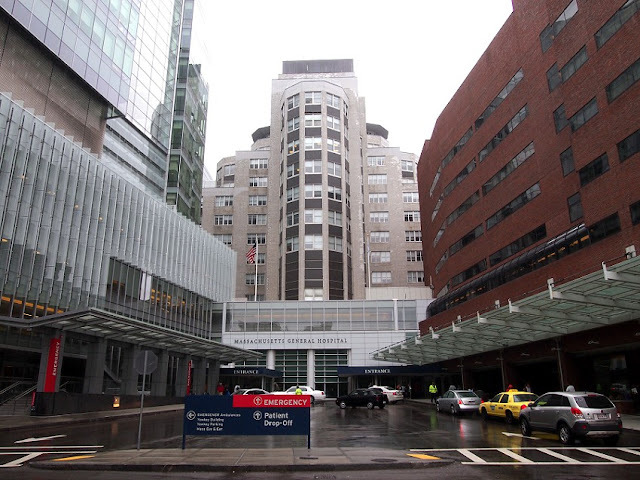 Massachusetts General Hospital recently surprised me with a new reason. It invited the public to come see a live mummy restoration. Wait, no. 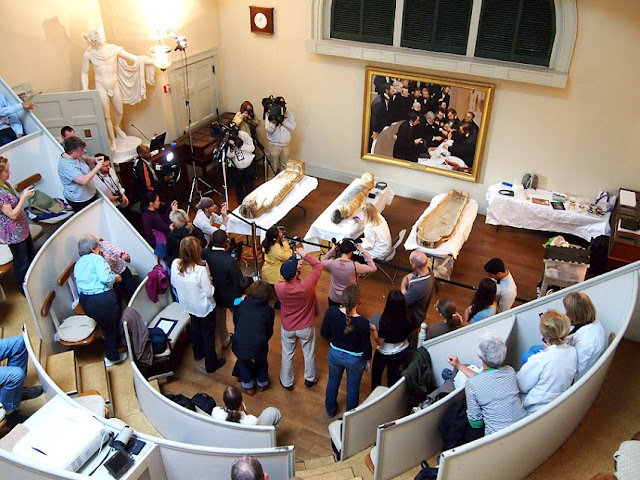 They invited the public to see a mummy restoration, live. You can tell which of those four headlines I really, really want to read sometime. There’s a lot of backstory on why a prestigious Massachusetts hospital is treating dead Egyptians. The short answer is because one hangs out there. 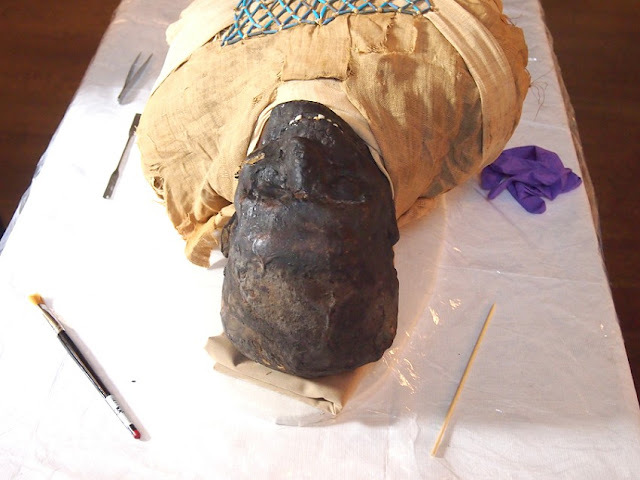 I wrote about the whole thing in The New England Grimpendium and posted a bunch of photos here on OTIS of the MGH mummy after my first visit to it, back in December of 2009. 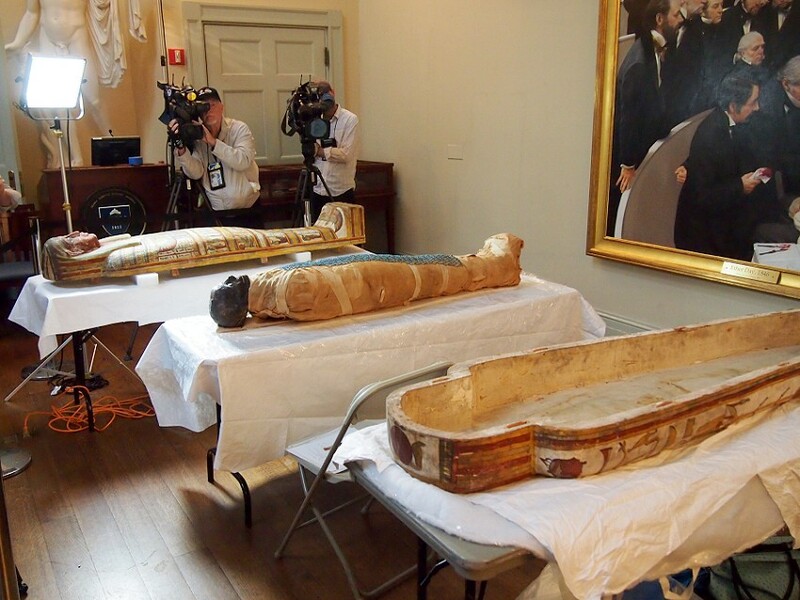 Here’s a quick summary, though: In 1823, MGH was gifted the first complete Egyptian mummy-with-sarcophagus to ever come to the U.S. His name was Padihershef, and he was a 40-year-old tomb carver from Thebes. They toured the 2,500-year-old corpse around the country as a fundraising attraction before retiring it to an operating theater in the Bullfinch Building, the original home of MGH. Later, the room would become the famous Ether Dome, the site of the first public display of surgery under anesthetic, an operation that the mummy watched bemusedly (“In my day, they’d trepan you with barely a whiff of blue lotus.”). Today, you don’t need an injury to visit the hospital to see either the Ether Dome or its creamy mummy center. You just have to time it for when the room is unoccupied by classes. The Ether Dome is pretty simple to get to. True, the almost 200-year-old Bulfinch Building has become just a small part of the overwhelming warren of medical facilities that is MGH. But just inside the main entrance of the hospital is an information desk. You can ask for directions there, but you’ve already done the hard part by walking into such an intimidating place. Walk down the hallway behind the information desk and follow the signs to the K elevator. Take that elevator to the fourth floor, where more signs will direct you down a short hallway to the Ether Dome. When I arrived, the camera that was dangling brazenly from my neck and the Carl Kolchack mask wrapped proudly around my face got me mistaken for press, and then Michelle Marcella, who manages public affairs for MGH’s prodigious historical legacy and who personally introduced me to Padihershef years ago, backed me as one. That meant I got unexpected early access to the mummy, while everyone without a press pass had to wait in the bleachers of the operating theater for their turn later on. But that’s pretty cool, too. The Ether Dome is the classic type of operating theater that you see in period movies. It’s small, and mostly taken up by a semi-circle of tiered seats that rise a vertiginous five rows from the floor. The floor itself was just that, and when not being taken over by a mummy restoration usually features a podium surrounded by a large marble statue of Apollo, a human skeleton, a massive painting depicting the surgery that gave the Ether Dome its name, and a case or two of antique medical equipment. All that stuff was still there, but pushed to the sides for the main attraction. Above it all was the copper glint of the interior of the Bulfinch Building dome, viewable outside from the courtyard just off Parkman Street, where the original MGH building is swallowed up by the towers of the modern hospital. I got there right at the start of the four-hour restoration, and the seats were already starting to fill with people that included doctors, nurses, and other hospital staff, all spending their breaks away from live patients to check out a dead one. Padihershef and his sarcophagus had already been removed from the pair of cases that had been its comfort zone for so many years and laid out on three parallel tables on the operating floor. 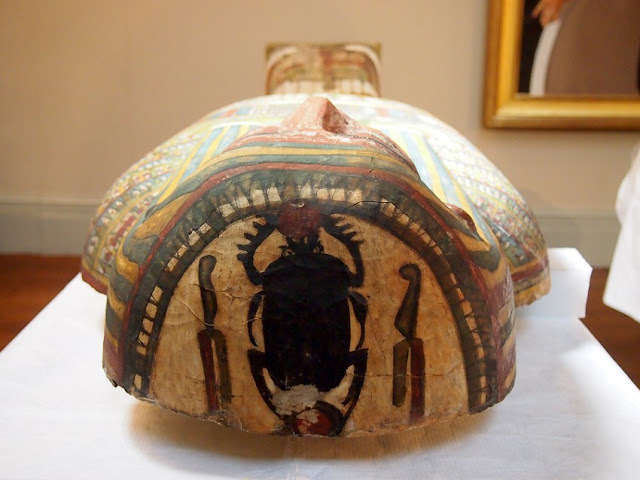 The two halves of the sarcophagus, with their extremely well-preserved hieroglyphics, took up the bookend tables, while the center spot was dedicated to the shriveled, black, linen-wrapped body of the mummy. 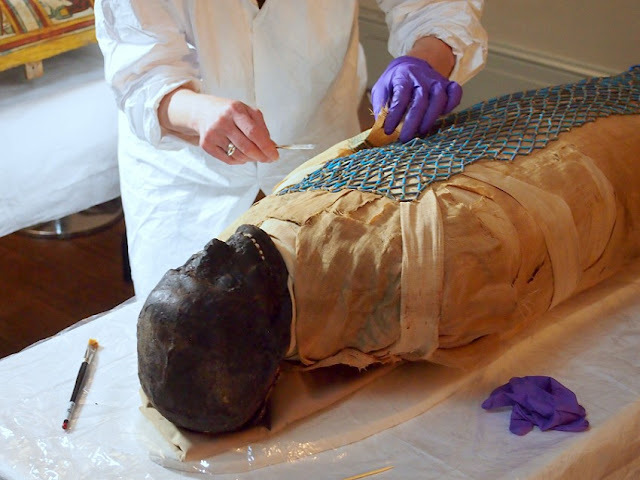 A rope stretched across the width of the floor gave the mummy a small bit of personal space, only penetrable by the conservator and the official hospital crew who were recording the procedure. But being on the other side of that tape still meant you were within just a couple of inches of naked, black mummy cranium sticking cozily out of his papoosed body. You could get close enough to see the shockingly white teeth, the fuzz of hair on his head, and to feel kind of weird by the realization that your mouth and nostrils are within inches of the flesh and bone of a person preserved for millennia. I’m not sure why I’m phrasing the realization that way. Now, I’ve seen a lot of mummies in my day, but always with at least a pane of glass between me and them. Getting so close to an open-air mummy was thrilling in an all new way. Usually “mummy thrill” comes from the fact that you’re seeing an ancient dead person who is also symbolic of an entire ancient culture. But this was more real. 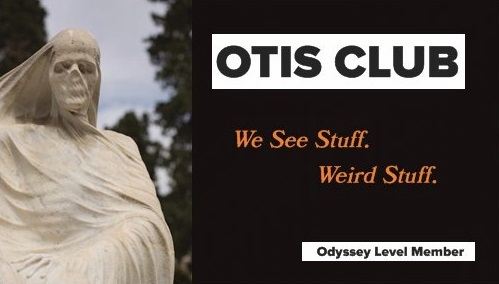 Like I was seeing a mummy in high-def, really getting on some personally unplumbed level that it was simultaneously an actual person, a valuable artifact, and an ancient thing. After all, everything on my TV is behind a pane of glass, too. Speaking of TV, being on the floor with the media meant contending with a small armory of television cameras and microphones and jostling reporters and photographers treating Padihershef like a celebrity who’s only in town temporarily to film a movie. Understandably, of course. They did at least refrain from questioning him, aiming those at the blond, bespectacled woman arranging her tools and about to get down to the mummy makeover. 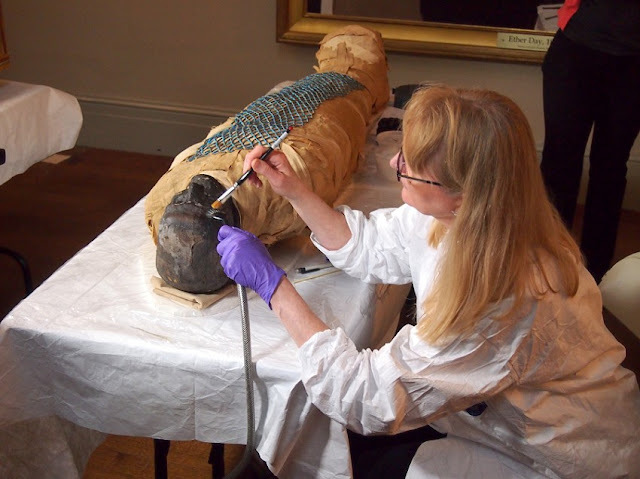 Her name was Mimi Leveque, and she gave her title as “Conservator of Objects” instead of “Master of Mummies,” which is the title I would have printed on my business cards had I been her. 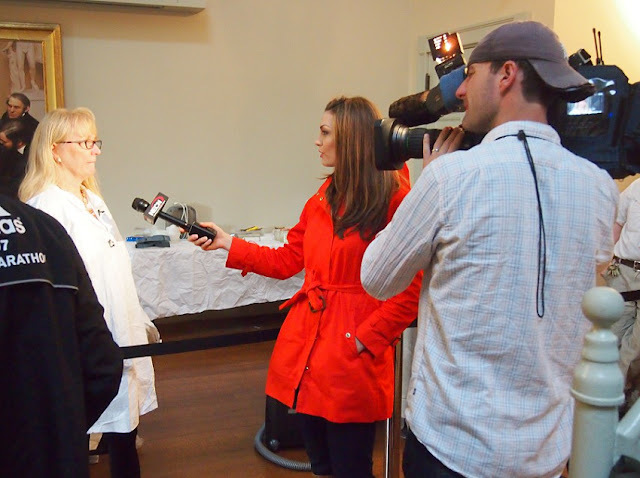 She was asked so many questions, that it was difficult for her to actually do the work that was the whole point of the event. 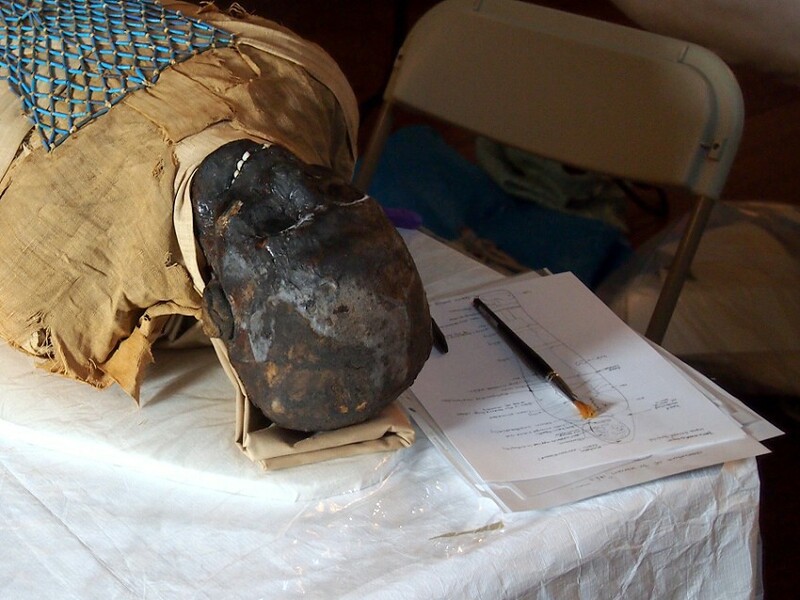 But that was cool, too, because there is a lot of great little factoids about this particular mummy. Like Padihershef has never been unwrapped past his head, and that scans have shown that his head is kept on his body with a broomstick, inserted at some point in modern times, just like that scene in Idle Hands. Except I think that was a meat fork. Also, that his brains are still in his skull instead of having been fished out through his nose with a hook as is usually the process. Also that one of his ears is prosthetic, made of linen. I don’t have a movie reference for any of those latter facts. In between answering questions, she got down to work, which involved vacuuming dust from his lineaments and the leached salts that powdered his head a dull white in places. For the more stubborn accretions, she used a swab dabbed with her own saliva to gently break down the salt. Because I guess licking its face was out of the question. So, in many ways, it was a pretty mundane little operation…that kept me spellbound for an hour and a half, and even then I only reluctantly left for something that was pretty important at the time, I guess. In thirty years, I’ll have long forgotten whatever else I did on that rainy June day, but I’ll still be telling the story of the time I saw a mummy resurrect from the dead after getting its face licked. My mind will have exaggerated the story somewhat by that time. On my way out of the theater, I noticed his old cases, vertical antique things made of wood and glass, one of which had held the mummy and the bottom half of the sarcophagus, the other the top of the sarcophagus. After his cleaning, MGH was moving him on up to the proverbial East Side, putting Padihershef in a brand new case that displayed him and his sarcophagus together, horizontally to give the poor guy a rest, and better sealed than those drafty old cases. It was an excellent idea on the part of the MGH staff to let people see this process firsthand and its mummy so directly. 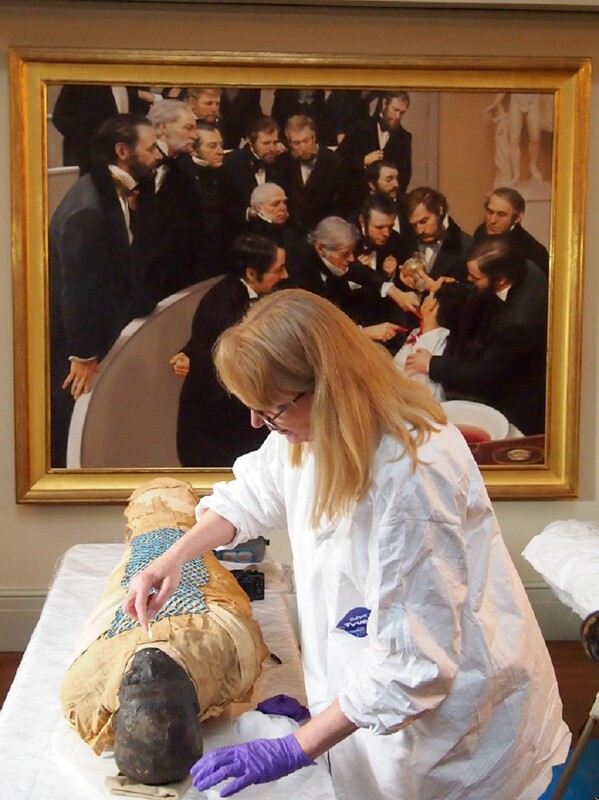 It’s the closest I’ll ever get to the intimacy of a Victorian mummy unwrapping, I think, which was a completely disreputable practice that damaged a lot of important archeological objects during that time…but still sounds to me like an absolute blast. I’m not sure I should have ended this piece with that admission.